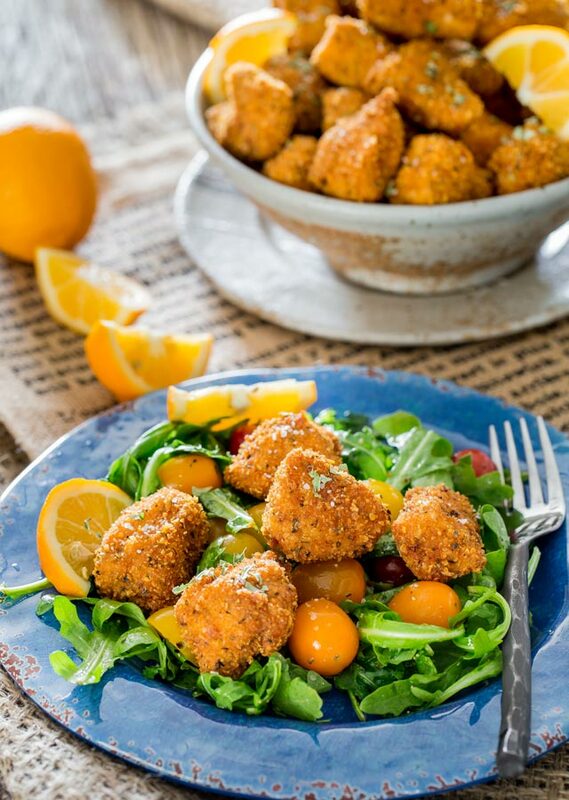 Chicken Milanese Bites – breaded chicken pieces, seasoned with Italian seasoning and fried to a crisp perfection. Super crispy and juicy, served with lemon wedges. Let me tell you chicken never got any crispier and tastier than this! I needed to celebrate today and one of my favorite foods is fried chicken. Don’t look surprised, I’m sure I’m not alone here. I needed to celebrate because I finally finished cooking all the recipes for my cookbook. I am so happy, it’s like a huge weight has been lifted off my shoulders. I cannot wait till this book is out so you guys can see it. 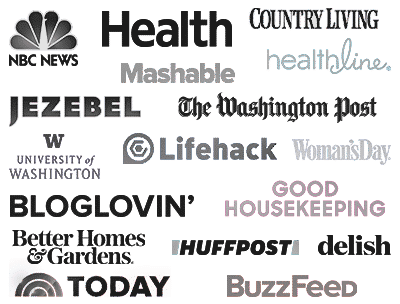 I have some great recipes in there, you guys will love them. 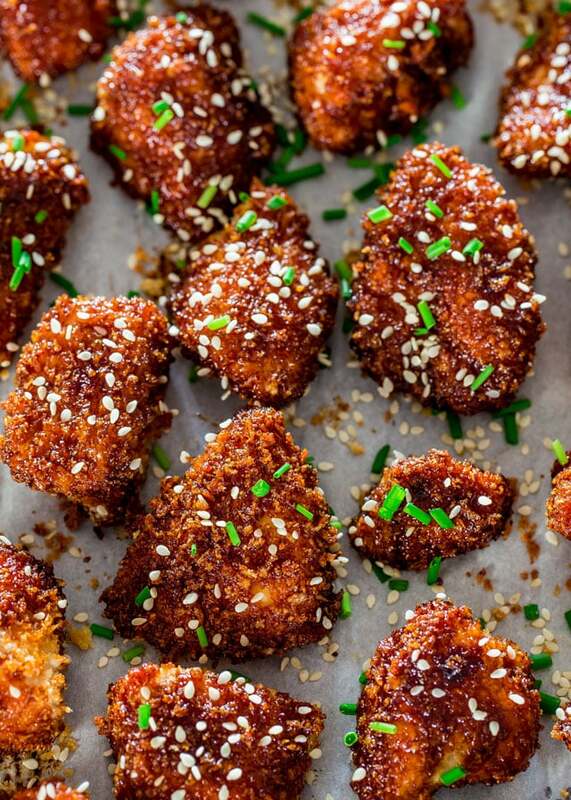 So crispy chicken. Milanese style! 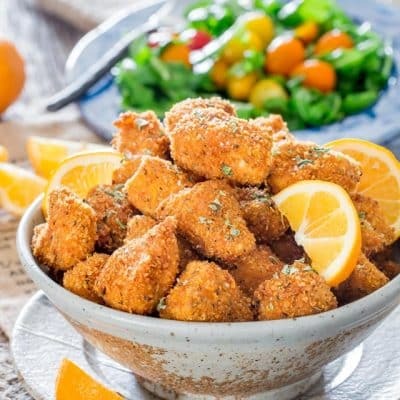 Chicken Milanese is simply breaded chicken in egg, flour, and breadcrumbs seasoned with Italian seasoning, fried then served with lemon wedges. Maybe it’s called chicken Milanese because it came from Milan, but who knows for sure. It doesn’t matter because all you need to worry about is that it’s good, it’s crispy and trust me with the lemon, you need to squeeze some lemon over this chicken, it just makes the flavors pop up. If you’re wondering why my lemons are orange it’s because they’re Meyer Lemons which I love love love. So good! Usually you use breadcrumbs in chicken Milanese, but I used corn flake crumbs and if you want extra crispy chicken this is the way to go. I served this with a simple arugula and tomato salad, arugula, tomatoes, olive oil, vinegar, salt and pepper. You can also serve this over pasta al pomodoro, yummy! To make this chicken milanese is the same as making fried chicken. You’ll need 3 shallow plates, one for the flour, one for the egg mixture and one for the breadcrumbs. I wanted that Italian seasoning flavor to come out, so I added a teaspoon of seasoning to each plate, including seasoning the chicken with it. When I make this I set up an assembly line. Raw chicken, plate with flour mixture, plate with egg mixture, plate with breadcrumb mixture, and finally a baking sheet to place the breaded chicken. This way it’s quick and easy. I use one hand for the dry ingredients and one hand for the wet ingredients. Then all you have to do is fry the chicken. 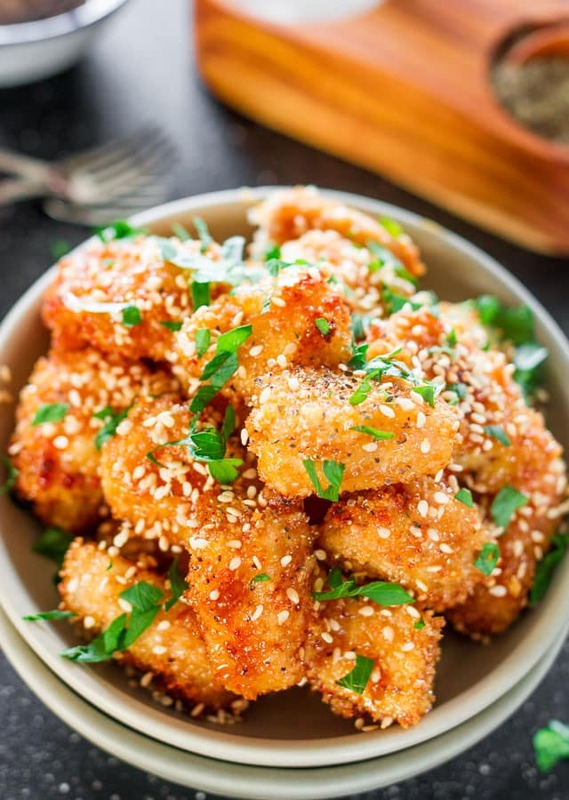 If you want to go the healthier route you can definitely bake this chicken and it will still be crispy. I’ve made similar chicken like this before baked and really you cannot tell the difference. 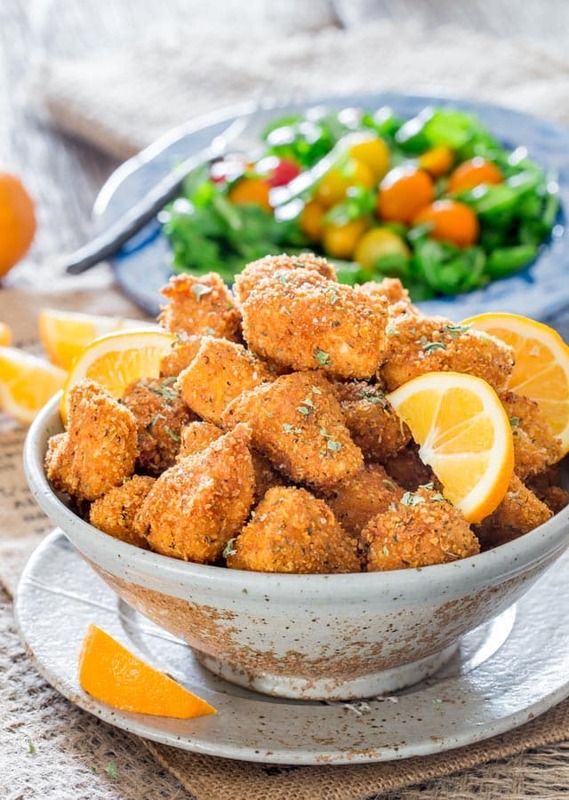 Chicken Milanese Bites - breaded chicken pieces, seasoned with Italian seasoning and fried to a crisp perfection. Super crispy and juicy, served with lemon wedges. In a large Dutch Oven or pot add vegetable oil so that you have at least 1 1/2 inches deep. Heat the oil so that it's around 350 F degrees. Meanwhile season the chicken with salt, pepper and 1 tsp of Italian seasoning. Set aside. In a shallow plate add the eggs, heavy cream and another tsp of the Italian seasoning and whisk well. In another shallow plate add the breadcrumbs with 1 tsp of Italian seasoning and mix. Finally, add the flour with the last tsp of Italian seasoning to a shallow plate and mix. Arrange your shallow plates so that you have the flour mixture, egg mixture and finally the breadcrumb mixture. You'll need an empty plate, or I used a baking sheet to place the breaded chicken in. Dredge the chicken pieces through the flour, then the egg mixture and finally the breadcrumb mixture. 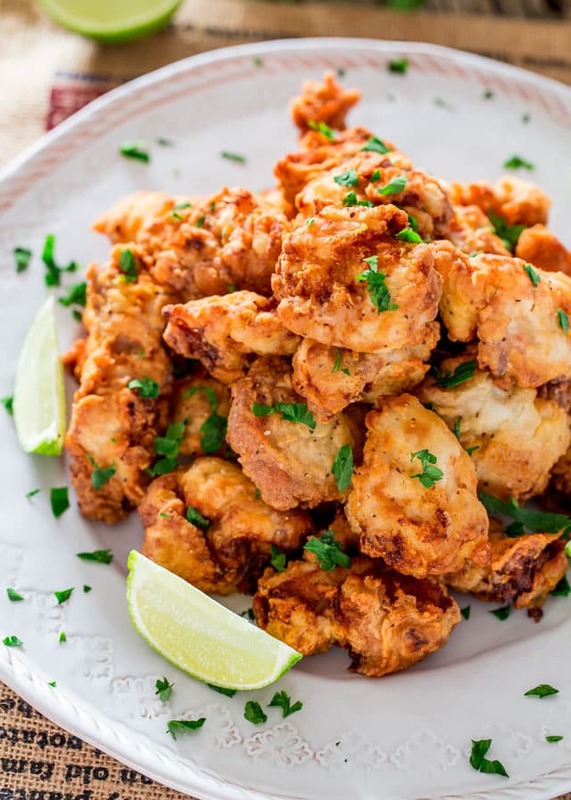 Fry a few pieces of chicken at a time, so that they don't stick together. They should take about 6 to 7 minutes before they're cooked through. You might want to cut into a piece to make sure it's no longer pink inside. Continue frying in batches until done. Season fried chicken with salt and Italian seasoning, if preferred. Serve the chicken with lemon wedges. 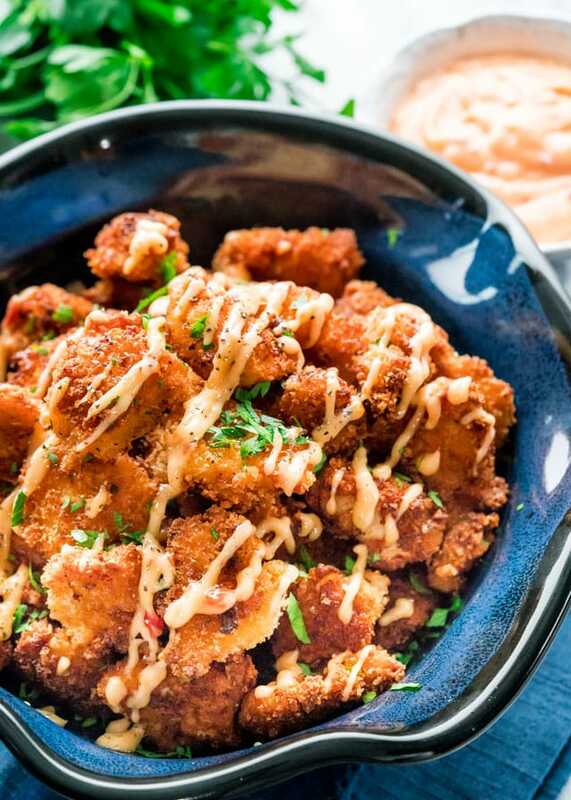 If you want crispier chicken bites you use Corn Flake crumbs. OH MY GOODNESS. 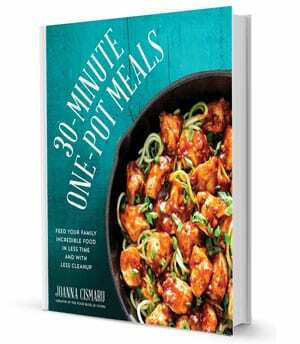 I was ecstatic for your cookbook before but now that I see it’s 30 minute one pot meals, I CANNOT WAIT!!!!! Congrats on finishing all the cooking, that’s quite a feat I’m sure! I love that you celebrate with fried chicken, yum! 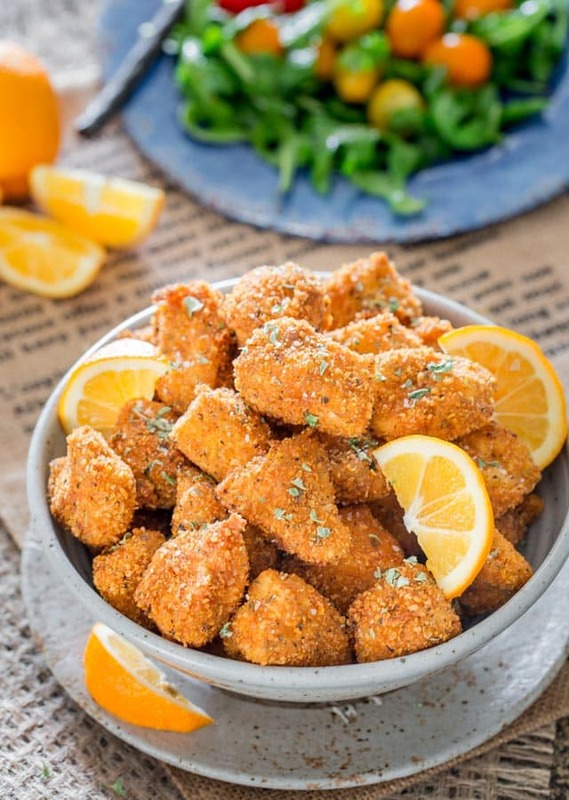 These bites look amazing and I’ve never tried anything like it with a squeeze of lemon. Sounds so refreshing. Way to go, Jo!! There was not even a flicker of an eyebrow or blink of an eye when I read that fried chicken is one of your favourite foods. It is why we are friends. I will, I will! I’ll make all the fried chicken you can eat, just get here! Can the Chicken Milanese Bites be printer friendly? Please advise.